Calculate the resulting frequency of any MIDI note number using up to six MIDI parameters. 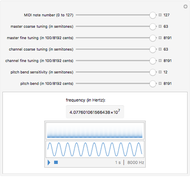 This is useful for MIDI musicians as well as audio engineers for recording. 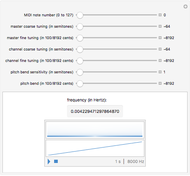 Snapshots 1 and 3 show the extreme ranges; however, only the support of a &PlusMinus;12 semitone range for Master/Channel Coarse Tunings is required by the current General MIDI Level 2 Specification. 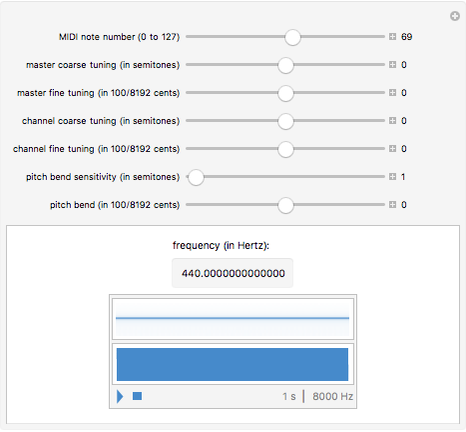 Snapshot 2 shows the MIDI Specification defaults as applied to A4 (440Hz). For practical use, referencing an 88-key keyboard, only MIDI note numbers 21 (A0) to 108 (C6) are useful (where C4 is Middle C). The use of Master/Channel parameters is cumulative, thus supporting twice their ranges when used together. 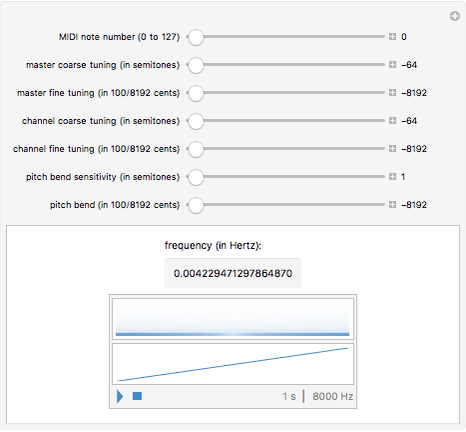 The Fine Tuning parameters allow up to a two-semitone offset from the base tuning reference of A = 440Hz. In all cases, the further use of Pitch Bend Sensitivity and Pitch Bend can extend the playback range by another octave. 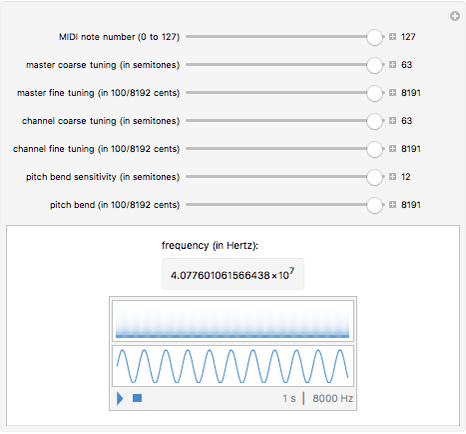 Benjamin Robert Tubb "MIDI Frequency Calculator"